Cumin is one of the flavorings most commonly mistaken for something else, or something else for it, owing to problems in translation from the languages of the lands where its use and cultivation are common. It is not much grown, even in home gardens, in the U.S., owing, we suppose, mainly to two factors: a belief that it cannot be grown outside tropical areas, and some uncertainty as to its culinary uses. Cumin is especially frequently confused with caraway, which it also resembles physically (the “seeds”, that is—which are not truly seed but actually the fruit of the plant—not the plants). But while caraway can substitute for cumin in some dishes, for many others—in Indian and Mexican cooking, for example—it is essential to have actual cumin. Despite one expert source’s remark that “The three major types of cumin seed on the market, Iranian, Indian, and Middle Eastern, differ in seed color, quantity of essential oil, and flavor”, there do not appear to be any named varieties available in seedsmen’s catalogues. U.S. seedsmen need to get on the stick as pertains to herbs and spices, and stop offering generic “no-name” cultivars (or, more likely, unsorted mixes). Many sources casually assert that cumin cannot be reliably grown in the north, but it has been reported as reliably grown well into Manitoba (and Norway). It appears to be a matter of timing, the conventional (and doubtless sound) advice being “Sow seed in spring or early summer when all danger of frost is over and the soil has warmed up.” The plant is frost-tender, can take up to 4 months from seeding to harvest, and likes warm to hot growing weather. None of that looks insuperable: if, hereabouts, we sow it in middle May, looking to a harvest in, at latest, middle September, we should be all right save in the freakiest of years. The general rule for herb and spice plants is that their soil needs are not demanding, save that the soil must be very well-drained: few herb or spice plants can stand “wet feet”. The soil should not be particularly rich, most especially not for flavoring plants we grow for their seed (or fruit), common mis-advice to the contrary notwithstanding: a rich soil will lower the concentration of the “aromatic oils” that give the seed its characteristic flavor, which is the very thing we are growing them for. Plants that are very slightly nutrient-stressed (which doesn’t mean starved!) give better-tasting seed. Cumin apparently fits that description excellently. Be sure to plant a good number of “seeds”, no matter how many plants you think you need, because you need an at least moderate-sized stand of the plants to keep them more or less upright (otherwise the disproportionate weight of their seed heads bends them over). 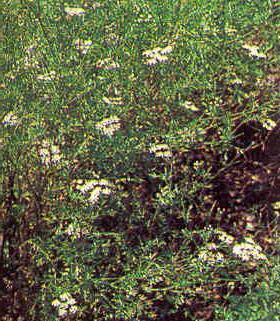 And even if you don’t have a deep-dug or raised-bed plot, try to plant your cumin in a block, not a row. Sow the “seeds” about ¼ to ½ inch deep where the plants are to grow (like many herb and spice plants, coriander does not take well to transplanting). The plants should be spaced quite close together. Keep the soil well moistened till emergence, and even thereafter. It would be wise to use row covers at least till all risk of frost is past—say to middle or even late June. Let the seedlings stay quite close together, as that lets them support one another as their relatively heavy seed heads develop. 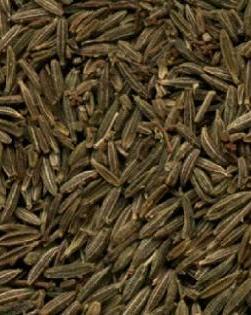 Water very well: cumin likes a damp climate (but, as almost always with spices, not “wet feet”). Cumin is said to be “intolerant” of long periods of dry heat, of which we get our share around here; perhaps some misting would be wise in such periods. The availability of honey bees as pollinators will usually improve cumin yields. Cumin “seeds” notoriously ripen unevenly, so you need to keep a close eye on your crop and harvest plants individually, lest the heads shatter prematurely. Let each plant grow till its first set of seeds dries enough to crack when pinched (it can take up to 120 days to produce mature seed; at that time, cut the plant. Hang cut plants to dry over a catch-cloth; when they are thoroughly dry, dump them into a holding bag (which you will later use for threshing them). It was last modified on Monday, 4 February 2019, at 02:42 EST.